In a recent post, I described a market timing experiment where a market timer decides each month whether to own the S&P 500 or to hold all cash. The result was that the market timer had to guess right 60% of the time from December 1990 to March 2008 to keep pace with an investor who simply bought and held through the whole time period. That experiment assumed that the investor was using a tax-sheltered account, as the Canadian Capitalist observed in his comment on that post. What happens if you have to pay taxes on the interest, dividends, and capital gains? I ran the experiment again, this time taking into account taxes. 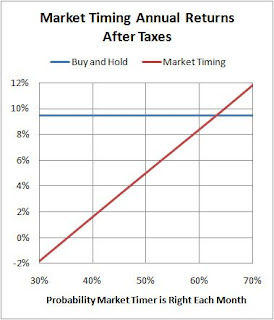 To give the market timer as much help as possible, I assumed that the buy-and-hold investor sells everything at the end of the complete time period and pays capital gains taxes. Tax rates vary from one jurisdiction to the next. For this experiment, I assumed a tax rate of 40% on interest income and 20% on dividends and capital gains. Comparing these results to the tax-free results from the earlier post, we see that taxes hurt the market timer more than the buy and hold investor. Now the market timer has to be right 63% of the time (up from 60% in the tax-free case) to break even with the buy and hold investor. It may not seem difficult to be right 63% of the time, but every time you choose to jump in or out of stocks, you’ll need to trade with someone who gets it wrong 63% of the time. The truth is that most of the time owning stocks is the right thing to do, and selling is the wrong thing to do. 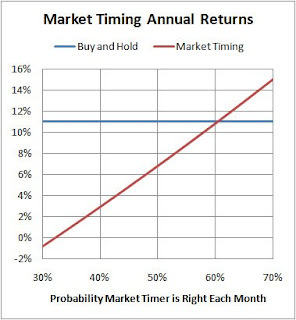 This makes it very difficult to guess the right time to be out of the market with high probability. If you are investing in an account that isn’t tax sheltered, you have even more reason to avoid market timing. All available evidence and logic tell us that the vast majority of investors can’t beat the market by market timing. This applies to professional money managers as well. I tried a little experiment to see how accurate a market timer’s predictions would have to be to succeed at beating the market. Market timing refers to the practice of jumping in and out of the stock market in an attempt to avoid market declines. Suppose that a market timer decides at the beginning of each month whether to have all of his money in the S&P 500 stocks or all of it in cash. His goal is to avoid being in stocks during the months where stocks perform worse than cash. Each month the market timer has a certain probability of guessing right. If he just tosses a coin, this probability is 50%. The question is how high this probability has to be for the market timer to beat the strategy of just buying and holding through thick and thin. I gathered data on the S&P 500 from December 1990 to March 2008 and ran some simulations. For each fixed probability of the market timer guessing right each month, I ran 10 million Monte Carlo simulations and averaged out the results. To account for commissions, costs due to stock spreads, and interest on cash, I assumed that the net return of interest minus costs averaged 3% per year while the market timer has his money out of stocks. A buy and hold investor over this period of time would have received an average compound return of 11.0% per year. From the results chart, we see that the market timer has to be right 60% of the time just to break even with the investor who buys and holds. If the market timer is right only 50% of the time, he will underperform the buy and hold strategy by 4.2% per year, on average. This is a huge penalty for just guessing. Over the full period, an initial investment of $100,000 grew to $606,000 by buying and holding. A market timer who tosses a coin each month will have a median outcome of only $312,000! This shows that our market timer missed many months where stocks rose significantly. It seems to be human nature to be tempted to believe that we can do better than buying and holding by anticipating market declines. The next time you are tempted to try market timing, remember that you have to be right 60% of the time (and the people you trade against have to be wrong 60% of the time) just for you to break even. Do you really believe that you are that much better than all the other market timers? People have a lot of tendencies that serve them well in many aspects of their lives, but can be harmful when it comes to investing in stocks. One of these tendencies is to prefer the familiar over the unfamiliar. I saw this during the high-tech bubble when ordinary people with minimal investing experience suddenly had stock options worth more than their houses. For some reason, these people found it difficult to cash out even though the stock options represented 80% or more of their net worth. The usual answer was something like “No way! That would be a ridiculously risky thing to do.” But, to my knowledge, only one person who tried this mental exercise with me was persuaded to cash out most of his options. Most people continued to hold their options until well after the bubble burst. For some reason, people felt more comfortable with the familiar situation where they continued to hold their options. Cashing out felt risky to them, even though cashing out actually would have dramatically lowered their financial risk. Whenever you are trying to decide whether to sell some asset, you should ask yourself “if I had the money, would I buy this asset right now?” If the answer is no, then you should probably sell. This approach is particularly important when one asset has grown to dominate your portfolio. Of course, there are some caveats with this method of deciding when to sell. If you decide that a stock is worth owning at $30, and you buy it today for $29.99 per share, it makes no sense to sell it tomorrow for $30.01 per share. You need to take into account trading commissions, the cost of spreads, and taxes. Based on these considerations, you may decide that a stock is worth buying below $30, should be sold above $60, and just held for any price in between. This doesn’t necessarily mean that you should automatically sell the stock if it hits $60 say 2 years from now. If the company’s fortunes have improved dramatically, you may change your holding range to $50-$100. Even if the stock stays at $30, you may sell if the company’s business goes downhill, and your range changes to $10-$20. Where do these ranges come from? These ranges come from a fundamental analysis of the company’s business and future prospects. If you don’t know how to do this, then you should consider sticking to an indexing strategy for the stock portion of your portfolio rather than buying individual stocks. Bloomberg reports that mutual funds are selling stocks and hoarding cash. Of course, this would have been a better strategy when stocks were at a peak, rather than after they have dropped. This is definitely not a case of better late than never. When it comes to selling stocks in anticipation of dropping prices, I take the approach of better never than late. I just stay invested in stocks through the ups and downs because I don’t believe that I can predict the future direction of the market. It always seems easy to look back and think that what happened was inevitable, but it’s never so easy when you look forward. So, it seems that the professional money managers running mutual funds are no better than I am at predicting the future of the stock market. I feel confident in predicting that the current pain in the stock market will end sometime, but I have no idea when. Many individual investors will continue to sell their stocks and “wait until things get better.” This strategy will work for some of them. However, many of these investors will get it wrong and will miss the rebound in stock prices. So, I’m just going to sit tight. When we save for retirement, we tend to focus on that magical day when we will stop working. However, you won’t need to withdraw your entire retirement savings all at once on that day. For the most part, you’ll just need a certain amount per month plus the odd larger amount for things like a car, boat, or skydiving gear. Your retirement could easily last for more than 20 years. So, you’ll have to continue making decisions about how to invest your savings after you’ve retired. I discussed how reasonable this advice is here and here. But, let’s just take this table at face value for now. It is easy to misinterpret this table. It doesn’t refer to the number of years before retirement. It refers to the number of years until you’ll need the money. Think of splitting your retirement savings into many separate pots, one for each month of your retirement. (This is just a mental exercise – you don’t actually have to split your money up.) On the day you retire, your first 3 years of monthly withdrawals will not be in stocks at all. However, your monthly withdrawals planned for 20 years from now will still be 100% in stocks. Let’s say you are planning a 25-year retirement. That’s 300 monthly withdrawals. At any given time each one of these monthly amounts has its own percentage of allocation to stocks. It would be nice to blend these percentages together to get the overall percentage allocated to stocks. 1. You’ll withdraw the money steadily each year of retirement in amounts that grow with inflation. 2. Your stocks will grow at an average compound rate of 6% above inflation. 3. Your fixed income investments will average 2% above inflation. So, it turns out that following Swedroe’s advice, we still have half our money invested in stocks for the first few years after retirement. The assumptions that went into these calculations may not apply to everyone, but for almost any set of reasonable assumptions, retirees still need to allocate some of their savings to stocks. Insider trading is buying or selling a company’s stock when you have important inside information about the company that has not been made public. We tend to think of insider trading as being illegal, but that is an oversimplification. The top executives of a company almost always have inside information. If insider trading were illegal, then these executives could never trade their own stock. In the US, insiders are allowed to create prearranged trading plans, called 10b5-1 plans, for trading stock. The idea is that the executives can set out a plan to commit to trading stock at particular prices or at particular times. This way, the stock trades will happen automatically when the time comes, and the executive is protected from accusations of insider trading. It is possible that these executives had great insight into the future performance of their companies at the time they set up the prearranged trading plans. But there are other possibilities as well. So, it appears that in many cases these trading plans are being abused to allow executives to trade at will in their company’s stock. The next time you think that maybe you could make a fortune day trading, remember that in addition to trading against other day traders and paying commissions frequently, you may be trading against a company executive who knows what is likely to happen much better than you do. On a personal level, Eliot Spitzer’s choice to make use of a prostitute is a serious matter for him and his family. He deserves some pain for his actions. However, a much more serious matter for anyone who invests in the U.S. is his effort to clean up the investment industry. The investment industry has legal responsibilities to act in the best interests of investors when handling their money. However, it is fair to say that much of the industry focuses on working around these laws to acquire as much investor money for themselves as possible. Spitzer was heavily criticized for his attempts to clean up the investment industry, but these criticisms came mainly from those making money by taking it from investors. Chuck Jaffe has an interesting article discussing some of Spitzer’s efforts. Spitzer’s personal failings are a serious matter for his family, but are trivial compared to the billions of dollars lost by investors each year. Individual investors need more politicians willing to fight against corruption in the investment industry. Most commentators advise investors to shift money from equities to fixed income as they age, and this makes sense. We may disagree on the exact asset allocation percentages and exactly how soon before (or after) retirement to start lightening up on equities, but it seems clear enough that the average 40-year old should have more in equities than the average 80-year old. However, there is a body of academic work that argues that investors should maintain a constant asset allocation regardless of their age. This work is based on what is known as constant relative-risk aversion (CRRA). I’ll show the problems with CRRA in an example below. One consequence of the CRRA assumption is that the optimal asset allocation percentages remain constant regardless of the length of the investor’s investment horizon. Paul A. Samuelson advocates this view in his keynote address to “The Future of Life-Cycle Saving and Investing” conference. I first heard of this conference and the corresponding free online book from this post over at Canadian Financial DIY. Despite the fact that I disagree with one part of this online book, as a whole it is very interesting and makes you think. To show the problem with CRRA, I’ll consider a case where it gives silly results. To do this, I’ll have to pick a particular constant level of risk aversion. Morningstar uses the CRRA assumption in their star rating system for mutual funds. I’ll base my analysis on the risk aversion level chosen by Morningstar. A beer company decides to promote their new brand of beer sold in cases of 24 by roaming around to different bars giving away $24 to people who are drinking the new brand. The prize crew enters a bar and descends on a table where two friends, average Avery and rich Richard, are sitting drinking the new brand of beer. The answer to this question depends on how much money Avery and Richard have. Suppose that Avery’s net worth is $120,000, and Richard’s is $6 million. According to the CRRA assumption, to make Richard as excited as Avery, the math says his prize would have to be $340 million! This is obviously ridiculous. Just for fun, let’s make some seemingly inconsequential changes. Each man calculates his net worth more accurately, and Avery’s comes out $20 higher than he first thought, and Richard’s comes out $2400.10 higher than he first thought. Now, the CRRA says that Richard’s prize must be $11 trillion! You may find it hard to believe that CRRA could get these answers so horribly wrong, but that is what the math says. In fact, if Avery’s prize were $25, then according to CRRA there would be no amount you could give to Richard to make him as happy as Avery. Is This a Fair Test? Yes, it is. Most theories are based on approximations and simplifying assumptions. These theories can be shown to be wrong in extreme or unimportant cases. However, my example is directly relevant to long-term investing. CRRA gives answers that are close for small risks. But, for the large dollar amounts involved in long-term investing, CRRA gives ridiculous answers. Matthew Rabin has an interesting paper where he discusses the problems of extrapolating from people’s attitudes about small risks to making decisions about large risks. In truth, CRRA is more of a mathematical convenience than a valid theory. With CRRA, how much money you have and how much money you want to have aren’t relevant when deciding on your asset allocation. Without CRRA, Morningstar would not be able to give star ratings for mutual funds without knowing your net worth and your future needs for money. So, if anyone tries to tell you to maintain the same asset allocation for your whole life, remember that this advice is based on a faulty theory. Suppose that you invest $50,000 into a mutual fund with a 2% MER with a declining deferred sales charge starting at 5%. A better way to think of this is that you pay $2500 up front and get a $500 rebate on the MER for the first 5 years. After the fifth year, you pay the normal MER. With this view, the only difference between front and back-end loads is the MER rebate. It is easy to see now how the financial advisor gets paid up front either way. Don’t be fooled by deferred sales charges. They are effectively large up-front fees that aren’t much different from front-end loads. In an earlier post I was looking at what fraction of your portfolio should be in stocks. I also listed Larry Swedroe’s table of time horizon vs. stock percentage from his book “Rational Investing in Irrational Times”. His table basically says to put everything in stocks if you won’t need the money for 20 or more years. The stock percentage then drops steadily to zero when you are three years from needing the money. I’ve been looking for some justification for this advice. The answer comes from considering the utility of money. The basic idea of utility is that the wealthier you are, the less an additional dollar is worth to you. Suppose that if you invested your entire portfolio in risk-free investments, you would have $1 million when you retire. A game show host then makes you the following offer. You can just take the $1 million or you can toss a coin to get either $800,000 or $2 million. Would you take the sure $1 million or would you take the chance? What I really want to know is how much lower (or higher) than $800,000 you would be willing to go before the two options looked equally attractive to you. This gives an idea of your level of risk aversion. I developed a model of risk aversion based on the idea that underperforming the risk-free return causes pain, and the answer to the coin-flip question determines the amount of pain. More details on this model are at the end of this post. In applying this model, I assumed that your pain level is always relative to what you could get with risk-free investments. So, if your investments perform extremely well for a few years, and risk-free investing the rest of the way would give you $1.5 million, you would consider it painful to underperform $1.5 million even though a few years earlier the pain was relative to the $1 million level. Similarly, if your investments perform poorly for a few years, and risk-free investing would give you $750,000, you would consider it painful to underperform $750,000. I did the computations assuming the following. You consider a coin flip between $800,000 and $2 million to be equally desirable as a sure $1 million. Also, you consider a coin flip between $700,000 and $4 million to be equally desirable as a sure $1 million. This is a high degree of pain for underperformance. I also used the stock returns and volatility from the paper Portfolio Optimization by John Norstad (2002-09-11). Here is the resulting table of time horizon vs. stock percentages. The percentages are rounded to the nearest 5% because any further precision is pointless. Don’t get too attached to this table, though. The results are very sensitive to the answers to the coin-flip question. Consider the following two cases. Case 1: You consider the coin flips ($900,000 or $2 million) and ($850,000 or $4 million) to be equally desirable as a sure $1 million. In this case, you would be less than half in stocks even 30 years from needing the money. Case 2: You consider the coin flips ($700,000 or $2 million) and ($550,000 or $4 million) to be equally desirable as a sure $1 million. In this case, you would be 100% invested in stocks even during the last year before needing the money. In conclusion, I doubt that there will ever be any single answer to the equity allocation question. I tend to lean toward staying fully invested in stocks until I’m about 3 years from needing the money, but I may change my mind if I find a convincing argument to take a different approach. I came up with a series of points on a graph that reflected the pain of underperformance, and then found an equation to fit this curve. The challenge was to find an equation that made sense even in extreme cases, but also made the math easy enough to work with when applying the model. X – The final dollar amount after the returns on investments. T – A threshold dollar amount below which the investor starts to feel pain. a – A parameter for the incremental pain once underperformance is deep. b – A parameter for determining what is considered to be deep underperformance. The idea here is that when optimizing expected compound returns, any return X that is below threshold T is changed to the smaller value X*P(X) to reflect the investor’s pain. I don’t know if anyone has used this particular pain function before. and if x is below the threshold t, we replace x with x+p(x). Note that p(x) is negative when x is less than t.
The parameters a and b were computed so that the function P(X) would match the coin-flip answers. For the table I listed above, these parameters were a=4.74 and b=2.64. When I applied this model, the threshold of pain was always set at the risk-free return over the remaining years of investing. I began by finding the optimal stock percentage for the last year before the money is needed. Then I optimised the case where there are 2 years left to go knowing what would happen in the last year. I continued this for 40 years worth of results. There was an interesting discussion earlier this week over at Canadian Financial DIY about how much people should invest in stocks. This post pointed to an article by Zvi Bodie and Paul Hogan that discussed the cost of insuring a portfolio against loss among other things. You may remember Bodie as a co-author of the book “Worry-Free Investing” (see my review of this book starting here). He is a big proponent of investing in inflation-protected bonds rather than stocks. His reasoning is basically that stocks are too risky, even though they are expected to give higher returns. Let’s look at an example to explain what they mean. Suppose that you are about to invest $10,000 in a stock index, but are very worried about losing some of your money. You would like to pick a date in the future and buy insurance that tops up your stocks to $10,000 on that date if the stocks are worth less than $10,000. If they are worth more than $10,000, you get to keep the excess and the insurance pays nothing. How much should this insurance cost? This depends on how far into the future you choose for the insurance top-up date. Bodie and Hogan claim that as you push this date further into the future, insurance costs rise. Does this really make sense? I agree that insurance for a month will cost less than insurance for a year, but what about comparing 5 years and 30 years? 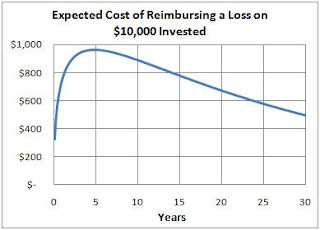 It seems to me that there is much less risk of losing money over 30 years than over 5 years. This would make the 5-year insurance more expensive and would contradict Bodie and Hogan. I decided to do some figuring to test my hunch. I had to make some assumptions about stock returns. Suppose that the expected compound stock return is 7% per year with a 30% standard deviation (both of these figures are worse than historical US data). As we can see from this chart, the insurance cost rises to a maximum after about 5 years, but then starts to drop. By this measure, after the first 5 years, owning stocks starts to become less risky. This casts doubt on Bodie’s arguments against owning stocks. Researchers at the University of Cambridge have found simple ways to compromise bank card readers. The next time you’re at a store punching your PIN into a debit card reader, if there is a paperclip or needle sticking out the back of the reader, you should be suspicious. The researchers Drimer, Murdoch, and Anderson have documented their findings in this technical report. They chose two different models of card reader and bought two each of them online for a total of $80 for the four readers. They then took one of each type apart to see how it worked and were then able to compromise the other readers simply. The card readers they examined were actually a type that is intended to work with higher security bank cards called smart cards. Instead of just a magnetic stripe, these cards contain a microchip that gives higher security. These cards are being deployed throughout Europe and are currently being tested in Canada. The researchers were able to probe the inside of the reader to get PINs and customer identities. This information makes it possible to make a duplicate bank card that can be used with the stolen PIN to clean out the victim’s bank account. For one type of reader the researchers poked a paperclip through an existing hole in the back of the reader to access internal information. For the other type of reader, they had to drill a tiny hole and insert a needle. In both cases they then connected a wire to the paperclip or needle and ran the wire to a device to store PINs and customer identities. Although these attacks were carried out against smart card readers, the problem has nothing to do with whether the bank card is a smart card or regular magnetic stripe card. The researchers were able to bypass security and read out important information from inside the card reader. In North America customers are protected financially from attacks like this because they are usually not held liable. The results can be very distressing while the problem is being sorted out, but in the end customers rarely lose the stolen money.